Please submit updated trail reports on our Facebook page . I know it's cliché but we did indeed walk through a winter wonderland. View from the moon.. I mean, the summit of St. Regis Mountain. A very frozen fire tower. Even though it was barely above 0 degrees, the view was spectacular! Looking out over the St. Regis chain of lakes from the fire tower. The trail was really dry and clear! Very little mud, but still a few new trees down. 59 hikers and 5 dogs visited! But they weren’t the only visitors — a lot of dragonflies have been frequenting the summit. August 11, 2018 – Bob Brand – Volunteer steward, Friend of the tower. I spent a half day on the St Regis summit as the highly remunerated summit steward. The trail is in fine shape despite some recent rains – only one very short slightly muddy section. Not a problem unless you’re trying to keep your brand new white sneakers pristine. There were about 60 – 70 climbers and I talked to about 2/3 of them. The remuneration I referred to ? Having great fun answering questions and talking to people about things I love – the mountains, lakes and ponds, and the St Regis tower. A great day. Note: you too can volunteer to be a steward. Go to http://www.friendsofstregis.org/calendar/. Thursday (8/9) the trail was moderately wet to start out. Lots of wet roots and rocks making hiking a little slippery, and with the overnight rain, conditions might remain that way! Some new downed trees throughout and some laying water and mud towards the end. The first mile and a half was almost totally dry. 59 hikers and 5 dogs visited the summit. Week 6: Our tower stewards have been busy on the mountain! Have you hiked recently? Feel free to share your pictures and stories with us! Katie and Jordan reported that the trail is mostly dry with a few wet spots and some down trees but overall it’s in perfect shape! Monday, July 9th- Unsure of the number but the beautiful weather brought lots of people to the summit! 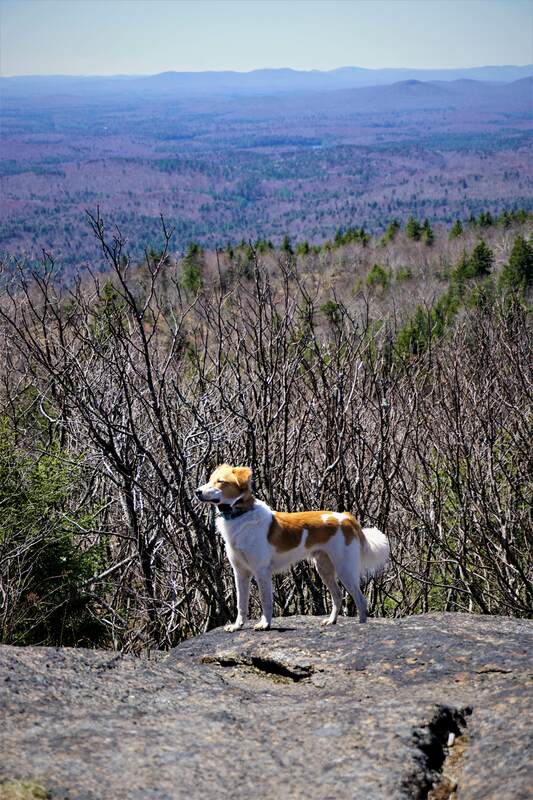 Now is the perfect time to hike St. Regis Mountain! It’s going to be very warm this weekend, so be sure to be prepared with lots of water and sun protection if you hit the trails. The trail up St. Regis Mountain is mostly dry right now. There are two trees fallen across the trail at about waist height, but otherwise, the trail is free and clear of obstacles! Now that school is out and summer is in full swing, more hikers will likely be seen on the trail. On Tuesday, June 26th, 71 hikers and 3 dogs climbed to the summit, and Wednesday, June 27th, saw 13 hikers. That puts our total number of hikers reached this summer at 258! The rain this weekend has likely made the trail a little damper but our tower stewards enjoyed the beautiful weather earlier in the week! The trail has been really dry, besides the two muddy spots toward the last mile; otherwise everything is clear. The summit has been beautiful and sunny! On Thursday, June 21st, there were 25 hikers and 4 dogs and on Friday, June 22nd, there were 36 hikers and 5 dogs. 6/17/2018 (Sunday) – The trail is dry for the most part, but a few trees have fallen across the trail. Coming down the trail, the sharp left turn near the trailhead might be missed since the arrow pointing to the marked trail has disappeared. Take careful care to follow trail markers! 6/7/18 – The trail was still pretty sticky, with lots of mud left over from the rain at the beginning of the week. Fortunately, the rain also brought lots of greenery! 31 hikers visited the summit. 6/10/18 – A gorgeous day! The trail was dry other than the usual muddy trouble spots towards the last mile. No one was safe from the black flies, but still a decent number of people climbed to the tower. 26 hikers and 4 dogs for the day. 5/28/2018 – The bugs were pretty nasty since there was almost no wind. 52 people and 2 dogs visited the summit! The trail was pretty wet. A decent sized bag of trash from the trail, summit and parking lot was packed out. Remember: if you carry it in, carry it out! 5/31/2018 – Much slower today, only 2 hikers and 1 puppy. The trail was basically dry, other than two or three muddy spots. Thankfully less bugs as well! Thanks to our Friend Mike for sharing a report and pictures from a trip to St. Regis Mountain on May 25, 2018! One of the pictures is from 1993. The rest are from this year. Here’s a blog post on ADK Trail Tales and Tails by a fellow Adirondack hiker from a hike up St. Regis. Thank you (and thanks to the pups!). Lower sections of the trail are dry and firm. Above the stream the trail gets wetter with more mud. Only the upper most portions on the north side have any remnant snow. Micro spikes are not needed. Many blown down trees make for some detouring. No bugs yet, but expect them any day. Trout lily and spring beauty are in bloom. Trillium are just starting to break ground. Submitted by FOSRMFT member Doug Fitzgerald and friend Bill. 5.9.18 Work Is Done, Bill And Doug Take A Group Shot Before Heading Down. After four days of warm weather and rain, temperatures dropped into the low twenties overnight. Bill U. and I hoped that the freeze up would make the trail solid so we could easily hike on the top of the snow wearing just our MICROspikes. Waiting for cold temps paid off as we didn’t have to break out the snowshoes and never post holed. Judging from the fresh post holes we saw along the way, it was obvious that the hikers from the day before did not have it as nice. They should have donned their shoes, but the trail damage was not really a big deal. In the lower elevations the trail tread was solid ice and in the hemlocks there was frozen bare ground. After gaining a few hundred feet in elevation we started to get some reliable snow. From the site of the old observer’s cabin there was one to two feet of snow most of the way up. There was a muddy section about a half mile below the summit. A little rock/ice hopping made that manageable. As we turned to the north, the final steep pitch was covered well with a firm snow/ice surface. There was no snow on the summit and we were careful to stay on the rocks and ice to avoid impacting the soil that was already disturbed by frost heaves. We had the top of the mountain and the tower all to ourselves, which is often an advantage to winter hiking. It was an overcast day, but the visibility was good and we could pick out all the usual landmarks. The forecast for the rest of February is for warm days and cool nights with no appreciable new snow. That may complicate hiking if the surface softens up. Above the old cabin site it may be difficult to wear snowshoes, but without them hikers may find themselves post holing. That not only damages the winter trail, but it is also exhausting. No matter what the temperatures and trail conditions hikers will definitely need traction devices. Remember, hiking on muddy trails causes lasting damage, so if it warms up too much please wait for colder or drier conditions. Have fun and be safe. 2.22.18 Bill U. Some blow down along the way, but nothing major. 2.22.18 Bill U. In the lower elevations the trail was mostly solid ice, with some bare ground in the hemlock stands. 2.22.18 Dependable snow on the top half of the trail. 2.22.18 St. Regis Pond in the foreground, Little Clear Pond to the left and Upper Saranac Lake to the right. 2.22.18 The bare ground on the summit was heaved due to frost. It may not officially be winter yet but it certainly feels wintery up on St. Regis Mountain! Today, Friends member Janelle hiked up to the summit to find beautiful views, and some chilly temperatures. There hasn’t been too much traffic on the main trail in the month of December but the trail was still broken out. The lake trail was untouched. There were a few trees fallen in the trail but they were not major obstacles. Towards the summit, there are a few spots where there is more ice than snow, but nothing a pair of microspikes can’t handle. Traction of some kind is highly recommended. On Tuesday, Board Member Janelle and Summit Steward Carly hiked all trails leading to St. Regis Mountain and are happy to report that everything is in great condition! There are a few wet spots but no seriously deep mud pits. The Lake Trail is considerably wetter than the main trail from Keese Mills. No debris was blocking either trail. One thing to note, though, is that with the leaves starting to fall, pay close attention to the trail. It can be difficult to keep track when the trail is covered in leaves, especially the less-traveled Lake Trail, but the trail markers will guide the way! Enjoy the fall foliage! Happy trails, everyone! Beautiful peak!! Ender earned a patch, a sticker and a Certification card. It was the first time up St. Regis mountain for both of them. “Even though I wasn’t up top all that long it was still worth it. I talked to 30 people – the usual chit chat, answering questions, talking about the tower. I passed 26 more people on my way down that were heading up. I started down around noon. It was a nice day weather wise – a bit hazy off in the distance as is usually the case in the summer. It seems that most people are climbing St. Regis for the first time. “I was the first to sign in, and the first on the top, at 9:08am, on a typical hazy August morning, with a forecast of a chance of thunderstorms after 3pm. I had 48 visitors, and three dogs. When I had no visitors I either read a book, or wandered the rocky parts of the summit, surveying my kingdom. Most of the visitors were happy to hear a little about the history of the tower, and how it has been saved and reopened. Some older hikers could remember going up the tower when it was still active, and talking to the observer. Lots of people wanted help in identifying lakes and mountains. By and large the High Peaks were hidden in the haze, although the Algonquin / Iroquois ridge could occasionally be made out. At 12:40pm three hawks floated overhead, pushed up by the stiff westerly breeze lifting over the summit – a lovely sight. By 3:35pm the stream of visitors had abated and I set off down. On the way up I met two late parties – one of four and one of two. All in all, an enjoyable day. It was another beautiful weekend on St. Regis Mountain! Tower Stewards on Sunday and Monday spoke with many visitors. Carly spoke with 62 people on Sunday and 60-70 people visited Bob, our newest volunteer, on Monday! The sunny, warm weather has dried out most of the trail, except for a few muddy spots. 1 or 2 spots require a few cautious steps to traverse. Nearing the summit, there is a big tree that has broken but still is dangling into the right side of the trail. Just a friendly reminder to all hikers to be aware of your surroundings. We are happy to report that the mostly dry trail is in great hiking condition! There is one section of new blowdown, but it is not a major obstacle. Over this past weekend, we had Tower Stewards stationed both days. Ian spoke with 81 people on Saturday and Carly spoke with 49 people on Sunday. (Sunday) Nothing serious to report on the trail this week — all was free and clear of debris. Excellent trail conditions were found from mile 0.0 to 3.3! The calm winds meant that the bugs were out, but Tower Steward Carly still spoke with 54 people and 4 dogs. A few bugs didn’t ruin the spectacular views though! Happy trails, everyone! It was a beautiful albeit windy day on St. Regis Mountain! Nothing major to report on the trail condition, but that’s not to say it wasn’t an exciting day. 52 people and 6 dogs made their way to the summit today to see Tower Steward Carly. 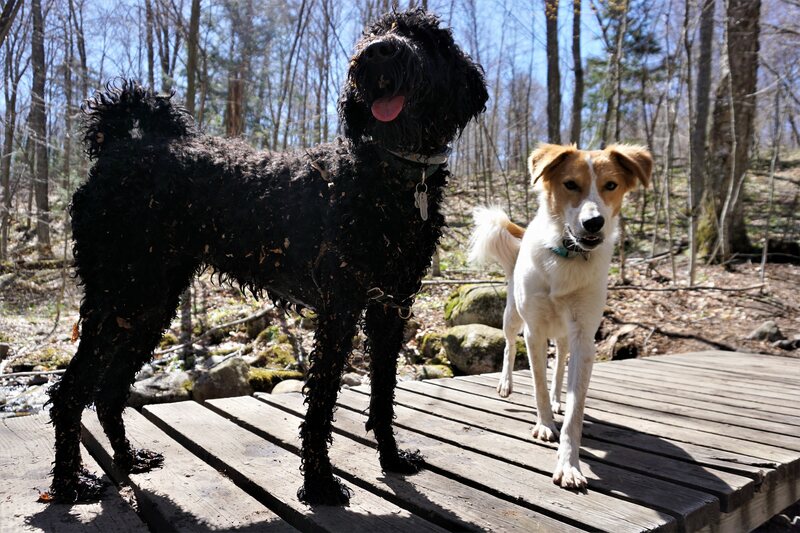 One dog even completed their Saranac 6 Challenge — congratulations! Lots of wildlife around today, including deer and snakes. The recent rains that have been around the Adirondacks certainly didn’t dampen any spirits today on the mountain! Tower Steward Carly spoke with 105 people today on the summit. There was not nearly as much water as last week but the trail was still muddy. Please do your best to stay on the trail. Muddy boots are a sign of a fun hike! Besides a few wet and muddy spots, the trail is in excellent hiking condition. Yesterday was a beautiful day on St. Regis Mountain! Adirondack Watershed Institute steward Carly spoke with 80 people on the summit, and saw 10 dogs! With all the recent rain, the trail was definitely wet and muddy. As always, please do your best to stay on the trail. Did you hike St. Regis Mountain this weekend? Share your photos and stories with us! We love hearing about everyone’s trips! Hope you had the opportunity to get out and enjoy this beautiful Memorial Day weekend! Over 60 people stopped to talk with our summit steward Ian today. The main trail is clear of debris and is fairly dry until the upper reaches with the exception of a few spots. There is a lot of mud in the upper reaches of the trail. Do your best to stay on the trail. There are several trees down across the trail. Many can be walked over – some require you to walk around (off the trail). There are also several VERY wet spots – on the lake trail as well as the main trail from the intersection with the Keese Mills trail to the summit. As always – do your best to stay on the trail. FYI the DEC trail crew cleared the blowdown on the main trail last week, but the Lake or TR trail spur did not get cleared. We have a report from two days ago that there are a number of large blowdowns on that section. It was reported that there are several large blowdowns on the TR/Lake trail (http://www.friendsofstregis.org/direction-and-trail-description-via-upper-st-regis-lake/). On Monday, 1/30/2017 two of us skied across Upper St. Regis Lake to Spring Bay where we started snowshoeing up the Lake Trail, aka the Teddy Roosevelt Trail. The lake was snow covered, but a layer of slush was just under the surface; if we stopped our skis iced up. The trail from the lake was not broken, but with light powder on top of a firm base it was easy to travel. The recently placed blue DEC markers made the route easy to follow. After about a mile we joined the main trail just above the site of the former Observers Cabin. From there to the open summit the trail was well broken with only a few inches of fluffy powder on the surface. Snow depths ranged from two to three feet and snowshoes were required all the way. As we hiked higher the trees had more and more powder on them, creating a winter wonderland. Within a few hundred yards of the summit the birches had a thick coating of ice and powder. They were bent over the trail requiring us to keep low and at times crawl under them. The summit itself was beautiful, with fresh powder and rime ice covering everything. There were only limited views, but the splendor of the place made the difficult climb worth it. Today was a great day on St. Regis Mountain. Fall foliage colors are peak here and now is the time to be on the summit. There were about 30 people on top when we arrived at 1 PM. Hiking from the lake trail required attention as the leaves are starting to cover the tread on this lightly used spur. There are a few blow downs on this section and while detouring around it takes care to find the tread up again. From the intersection with the lake trail, the main trail was dry and easy to follow. With the lack of rain it was surprising to see some wet areas and a lot of mushrooms growing. We had a great hike up the mountain today. The trail conditions were good, some wet spots but nothing major. There are a few small trees/limbs across the trail midway up, but easily stepped over. 3 Friends of the St Regis Firetower hiked today. The trail is fine, with some new blow down since our last hike (though nothing that inhibited the hiking). We hiked maybe 3/4 of the way up without spikes on our boots, but the steeps near the top were very icy and required the microspikes to be used. We wore them for more than 1/2 the way down. No hiking into the backcountry should be attempted without having spikes with you this time of year. The hike was relatively warm and ice free over the lower half – the upper trail and the summit was another story! The wind was blowing on the top and layers that were removed on the way up were quickly put back on once we were there. Always hike prepared for the worst – and enjoy the best! The purpose of this trip was to put up the first of the window panel dividers to insure they fit as intended. The rest of the window panels, as well as the other improvements, will be installed in the spring. Meanwhile – the tower continues to be closed to the public. 2 Friends of the Firetower hiked today to take measurements for future repairs, and to do some picking up around the site. The trail is in good shape, with lots of leaves covering the trail. It was somewhat slippery and wet near the summit. We packed microspikes, but did not need them. We may have needed the spikes if we had climbed a couple hours earlier. It is advised to have them with you this time of year. REMINDER – the tower is still closed to the public. The cab needs more work to be safe, and the cross pieces on the tower are going to be replaced before it is officially opened to the public. This will happen next year. The trail up the mountain is in excellent shape- from bottom to top! Everything was dry yesterday and should remain that way over the weekend if anyone is headed up to check out the changing foliage. Has anyone been up on the summit to check out the fire tower restoration work? It is definitely an exciting week on St. Regis Mountain! The trail was in great shape today from mile 0.0 to 3.3! Everything is dry and the only thing I will mention is that some of the rocks near the top are a little slippery. Other than a few slick rocks, it was all smooth hiking today! Did anyone else climb the mountain in all the fog and haze this morning? Views were limited all day but what an experience it was to be up on the mountain surrounded by all that fog! The trail is in great shape – bottom to top. Some muddy spots near the summit are slippery. One note as a reminder: after crossing the first new bridge (going up – it’s the second bridge on the trail) the trail goes over the rock to protect the low ground where the trail used to go. See photo. THANK YOU Cari from SCA (Student Conservation Association) for putting the barrier back up! The trail is in excellent condition! Most of it was dry and made for easy hiking. There were a few wet spots and a handful of slick rocks in the last mile of the trail but overall, nothing posed too major a problem (except for mosquitoes). As you gain elevation, you’ll notice the trail will probably become a little wetter, and perhaps muddier. But as I said, the majority of the trail is dry and easy to follow. Views were hazy Wednesday but still awesome! I have good news today: all the deep, standing water muddy spots on the trail are gone! I didn’t sink ankle deep into any mud today. Don’t let that fool you, though. The trail is still very wet. Rocks and exposed tree roots were slippery today, especially in the last mile of the trail. But other than a handful of slick rocks and roots, it is smooth sailing all up and down the trail. Without having to navigate through the puddles, I was able to get up and down faster than I have in the previous weeks. If you plan on hiking, please enjoy the footbridges built on National Trails Day! It is now possible to cross them without wading through muddy waters! Happy Trails! And hope everyone is able to get out and enjoy this beautiful weather! If you plan on hiking, my suggestion is this: be prepared for mud. This week the trail was more or less the same as last week. The muddy places were still muddy and the dry places were still dry. The big standing water puddle surrounding the new footbridges (about 0.4 miles in from the trailhead) did shrink a little by the end of the day, so hopefully with a few days of no rain the trail can dry out a bit! On my descent, I could tell some places became a little muddier with all the foot-traffic passing through. The mud seemed easier to deal with in the morning on my way up. Most of the deep muddy spots are within the first 2 miles. There were a few places I sank ankle deep into the mud, so be careful if you don’t want mud in your boots! As I said last week, be cautious on the rocks. In the last mile, the rocks were still wet (there was a lot of running water) and a couple places where all the rain has washed a lot of fallen leaves onto the rocks so those areas may be slippery. Wednesday was another beautiful day, with lots of sunshine and great views! Don’t worry if your socks or boots get wet- it’s nothing a little sunshine on the summit can’t fix! Hello everyone! Janelle here. I’ll be writing a small trail report each week so stayed tuned for conditions for your hikes up St. Regis Mountain! Overall, the trail is in great condition! Of course, with all the rain we’ve recently had up here, it’s definitely soggy in places. (Don’t worry- the views from the summit make all the mud worth it.) The trail is dry until you come to a few newly built footbridges (about 0.4 miles in) where a rather large puddle has formed. If you’re going to walk through the standing water to the bridges, just be aware they are floating so they move up and down. After the bridges, there are periods of muddy spots and dry spots. Most of the muddy places are easily crossed by searching for stepping stones or sticks hiding in the mud. The bigger bridge over the stream (about 2.2 miles in) marks the end of the really muddy spots. The rocks heading up from the bridge are wet and may be slippery but there are not big challenging mud puddles standing in the way anymore. The rock staircases definitely make the climb easier with all the wetness. I would just suggest a few cautious steps to avoid any slips on the rocks. One other note: all the standing water and mud has attracted some mosquitoes. Don’t forget your bug spray! Error: Error validating access token: Session has expired on Thursday, 21-Mar-19 18:01:33 PDT. The current time is Thursday, 25-Apr-19 01:25:45 PDT.